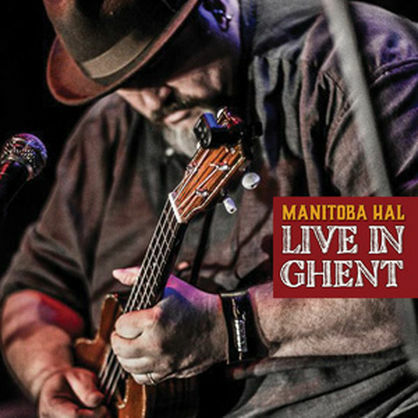 If you've seen Hal live, you'll have been fascinated about his mastery of the loop pedal. In a lot of ways, its a shame there isn't that distraction on this recording, it's audio after all, but it's hard on some of these tracks to believe it's just one man there. I saw him at both Unplugthewood and at the Winchester Ukulele Festival last year, but I didn't get to experience a full length gig like this. Hal is the master of the ukulele blues. This album proves it as it was recorded live at a gig in Ghent, Belgium in April 2016. No retakes, re-records etc. here, just a recording from the stage. For a live album, it's surprisingly good quality, too, just enough ambience to keep it "real", not too much to make it distracting. I find that blues can sometimes get a bit "samey", I'm a fan of Eric Clapton, but some of his stuff gets very familiar. The thought of one man, one ukulele and 24 tracks did make me wonder before I listened, but Hal's a genius at getting different sounds, rhythms and styles. His set has got a great mix of old favourites and originals and he involves the audience in a great way. It's a foot stomper from start to finish. "Tastes Like Chicken" is probably my favourite track, but it's difficult to pick one, as you listen to the album more and more, others catch your ear. Listen to the way Learned Pigs & Fireproof Women builds up, amazing. Hal's timing and tone is perfect throughout the whole album. This is one of those live albums that makes you sorry you missed the show. He had the audience making chicken noises, and he's no hypnotist! Hal's music is available here. He's quite a prolific artist, I'm sure others are worth a listen too, but this one with 24 tracks has got to be a bargain. 24 tracks, 1 hour 25 minutes. Hal's a cool cat, for sure.